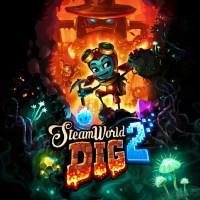 A 2D mining Metroidvania and a direct sequel to SteamWorld Dig . Like before, you dig up and sell ores, find and buy upgrades and new abilities, and periodically have platform challenges and a boss fight or two. But this time everything’s bigger and better. The world is larger and more varied and new powers have a much greater effect on how you traverse it. There’s no longer any need to buy ladders (thanks to the new movement abilities) or teleporters back to the surface (as there’s an extensive fast travel system). While there is some backtracking to get access to new areas with your new powers, the fast travel and the shockingly good map make this painless. You can also decide which upgrades to use based on your current goals - reassigning your “upgrade cogs” to maximize your earning potential, your combat survivability, your mining efficiency, etc. I normally don’t like having to fuss about with loadouts but here I found it an enjoyable part of the gameplay loop because the UI is so painless and you get new abilities to try and more cogs to assign at a good rate. The platforming challenges are more interesting than before thanks to the new movement abilities - and sequence-breaking by figuring out how to use these tools to get somewhere ahead of schedule is rewarding. New abilities improve your combat options as well, leaving combat more enjoyable and better integrated than in the first SteamWorld Dig where it always felt a bit out of place to me. The plot is slightly more developed, presumably to support the game being two or three times as long, but still pretty lightweight and doesn’t really offer a satisfying conclusion. Optional objectives (finding all the secrets, completing the game under a target time, etc.) are back to raise the skill ceiling again and this time they are accompanied by a brutally-difficult post-game set of challenge “trials”. Resource management is less of a concern now as water (fuel for abilities) and money (used to buy upgrades) are no longer finite. Water deposits are not used up when you refill, and while there is a limited amount of ore in the world it’s possible to farm money from enemies if you run out. It’s perhaps a little too easy to get into this state, either by selling too much valuable ore before you have the best sell bonuses (more likely if you sequence-break) or losing a valuable load of ore by dying before taking it back to town. That latter bit of punishment feels out of place - most of the game is more forgiving and if you die in one of the game’s many challenge caves you’re just reset to its beginning checkpoint. Punishing death outside of caves by destroying a limited resource instead of just dropping it and requiring the player to reclaim seems at odds with the rest of the design. The limited flashlight still feels pointless - it forces you to return to the surface frequently, but the player already has to do that to sell their ore or refill their health or water. These loops are more natural and satisfying - selling ore gets you money for upgrades and if you’re low on health or water then popping back to town is likely a nice breather from whatever intense combat or exploration you were engaged in - but going back up just because the timer expired is obnoxious. Thankfully, there’s eventually an upgrade that prevents your light from running out, but this makes the whole thing feel like an annoying limitation placed on new players just so the game can have more in its upgrade tree. The few missteps are tiny and easily forgotten, however. Overall, this is a very polished game. It gives you a lot of freedom in how to approach it, supporting and rewarding new players and veterans alike. It’s just as well paced as its predecessor, bringing new abilities, challenges, and environments just when you’ve mastered the old so that nothing wears out its welcome and the desire to see what’s next is likely to propel you forward. It’s a textbook example of a good sequel - taking what made its predecessor great and making it even better. I Stopped Playing When: After about fifteen hours I finished the game having collected 100% of the secrets. I was left wanting more, but the trials weren’t what I was looking for and I didn’t relish the idea of starting over with no upgrades or movement powers so I haven’t returned to it. Five Stars: Favorite. This is one of my all-time favorite games that made a significant impact on me or that I've returned to time and again.